Sitting in my in-box is a report on deaths among our hostel residents during 2013. I busy myself with other e-mails, mentally preparing myself before opening it. And because I know what it will contain, I focus my mind on a couple of colleagues, Dave and Dennis, both of whom were once street drinkers knocking back death defying quantities of alcohol and are now, having tackled their addiction, skilled hostel workers. Eventually I resolve to click open the report. It includes the following grim statistics. There have been thirteen deaths, ten alcohol-related. In all but one case the specific type of alcohol that caused this carnage was lager and cider of above 7.5% alcohol by volume (abv); the super-strengths. It’s a sickening, upsetting report. ‘Sarah’s lower intestine ceased working because of alcohol misuse, causing system failure’. ‘Rick was admitted into the intensive care unit but suffered massive organ failure due to long-term alcohol-related health problems’. ‘Alan died from oesophageal haemorrhaging caused by ruptured oesophageal varices (veins) brought on by liver cirrhosis’. We are too familiar with such reports, as I’m sure are organisations the length and breadth of the country supporting people with alcohol dependency problems. In London, 40% of rough sleepers have an identified alcohol problem. The destitute and addicted invariably gravitate to the strong, cheap super-strength lagers and ciders such as Tennents Super, Carlsberg Special Brew and White Ace. For ten years we have campaigned long and hard to tackle the devastation caused by these drinks, seeking to increase the price and reduce availability. It is a campaign supported by a partnership that includes the voluntary sector, health professionals, the police, local authorities and communities. We are heartened by the breadth of support and the opprobrium with which the super-strengths are held is little short of universal. Yet their impact remains undiminished. Massed cans of Kestrel Super gleam enticingly in bulk on off licence shelves. In my local shop, plastic three litre bottles of White Ace line the aisle, conveniently close to the till. The major supermarkets, with apparent indifference, continue to stock super-strength lagers. Our few successes, such as convincing Heineken to take the commendable step of stopping production of their super-strength ciders White Lightning and Strongbow Black, have not loosened the grip of the super-strength beast. These drinks are astonishingly cheap. Other liquids, including bottled water, are decidedly pricey in comparison. With the cheapest half litre of methylated spirits retailing at £2.50 and a similar volume of White Ace costing 99p, there is little prospect that we will see the resurgence of the meths drinker should the white ciders ever face a substantial price hike. We are fully aware, of course, that if super-strength alcohol was not available, the seriously dependent would not become ‘dry’ overnight. But experience shows us that if we can move people onto weaker beers and ciders, the damage to their health slows and the periods of lucidity during which we can productively engage with them increase. Bewildered and appalled, we continue to see super-strength lagers and ciders cause more deaths among the homeless population than heroin and crack combined. And, as I am often reminded by landlords, many of those seriously addicted to super-strength alcohol are housed, remorselessly drinking themselves to death behind closed doors, too often friendless and isolated. Yet there is hope. The government may have reneged on its commitment to make strong alcoholic drinks more expensive through the introduction of a 45p minimum price per unit of alcohol in the face of fierce lobbying by the drinks industry, but locally councils, voluntary sector organisations, the police and community groups have been galvanised into joint action to reduce both the appalling impact on health and the associated anti-social behaviour problems that accompany the consumption of super-strength drinks. 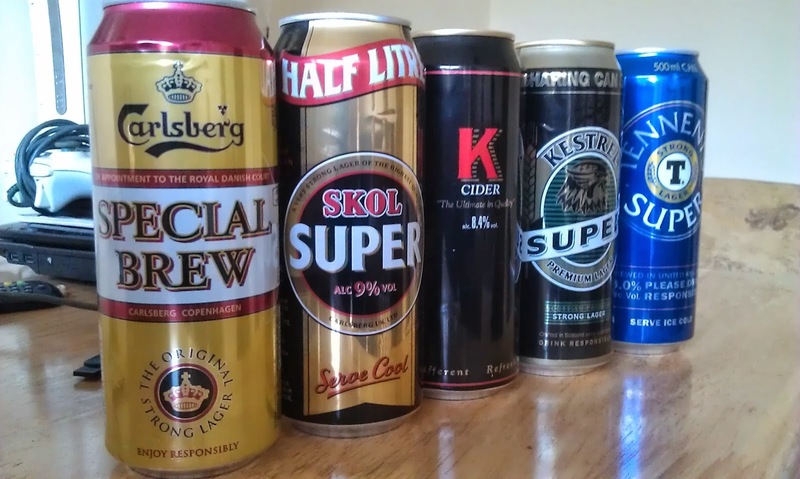 One of the most effective initiatives is the Reducing the Strength campaign led by the Suffolk police which secured agreement from two-thirds of off licences in Ipswich to stop stocking super-strength ciders and lagers. The compelling results from this campaign showed street drinking and associated anti-social behaviour falling dramatically alongside positive health outcomes as people were helped into treatment. Unsurprising, similar campaigns are being considered in towns and cities across the country. Meanwhile the drinks industry, viewing these local uprisings with considerable nervousness, is seeking assistance from the Office of Fair Trading to challenge them on the grounds that European competition laws are being infringed. You will understand that, when it comes to deriving profit through blighting the lives of people and communities, it is important that a level playing field is maintained. I don’t know why I have kept the letter for so long, a small piece of sustenance perhaps to alleviate the ache caused by our failure to prevent the super-strengths taking their toll. Or maybe it’s just the coruscating simplicity of the statement that is its culmination. It is a letter written by Rosemary, a 64-year mother of two, to David Cameron in support of our campaign. ‘I have seen and experienced the ups and downs of life’, she says, ‘and accept that part of living is making choices for oneself about how to live one’s life. However, what choices do those down on their uppers have, those homeless, jobless, friendless and penniless?’ And then the statement that so perfectly sums up the essence of our case: ‘Prime Minister, there seems to be a profusion of evidence pointing to a need for a change, but no evidence for doing nothing’. I was unaware of the initiative in Ipswich, such an obvious solution for positive change, but the unfortunate reality is, cheap booze has become the primary source of income for small retailers. I'm in Catford/Hither Green, where off-licences and corner shops are geared up to monetise on the vulnerable. I’m puzzled you used Heineken as a tag? I don’t associate that with super-strengths! Anything that increases "the periods of lucidity during which we can productively engage" is key to change. Enjoyable read! Liam thanks for the comment. Interestingly in Ipswich the police tell me that the small retailers didn't lose income though I am not clear why this should be the case. I'll ask further. I tagged Heineken because they are the good guys. They stopped producing White Lightning and Strongbow Black. It hit their profits but they still did it. Oddly on Twitter I still read that people are drinking White Lightning or seeing others doing so, which is impossible. It's almost as if White Lightning has become the generic term for a white cider. I see, I didn't know Heineken were behind White Lightning! I think you're right about the term still being used generically. Awful stuff!